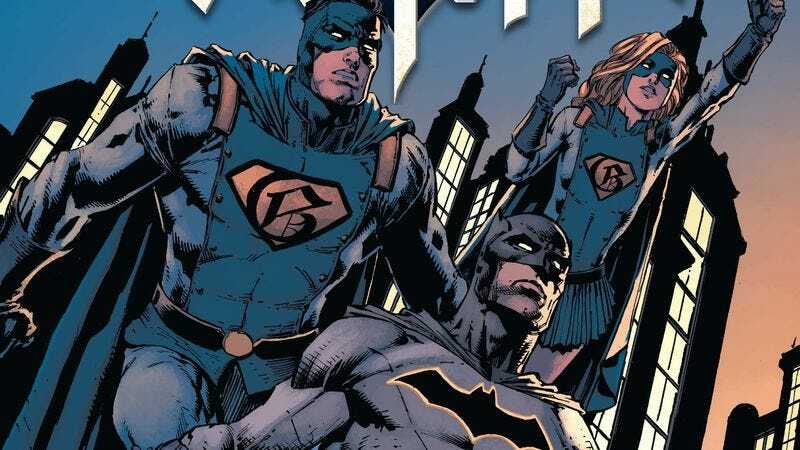 Batman was the breakout title of DC’s New 52, and the book’s DC Rebirth creative team has a very high bar to clear if they want to match the success of Scott Snyder and Greg Capullo’s run. DC made a wise choice in hiring rising star writer Tom King to script the now-biweekly flagship series, and while the book hasn’t drifted too far from its predecessor in terms of tone, King’s storytelling style is very different from Snyder’s. Whereas Snyder took a more novelistic, narration-heavy approach, King’s scripting is stripped down and driven by action and dialogue, giving the book a brisker, more dynamic pace. That dynamism transfers to the work of King’s artistic collaborators, with Mikel Janín’s bold, kinetic work on the Batman Rebirth one-shot and David Finch’s spectacular blockbuster action in Batman #1. King has a firm understanding of Finch’s strengths as an artist, and this preview of next week’s Batman #2 continues to keep the focus on action as Batman teams up with Gotham’s new dynamic duo to take down Solomon Grundy. Joined by Matt Banning and Danny Miki on inks and Jordie Bellaire on colors, Finch is doing some of the cleanest work of his career on Batman, and the sound effects by lettering master John Workman add extra impact to key moments in the fight. It’s still too early to tell if this current run will reach the heights of what came before, but there’s plenty to be optimistic about in the new Batman series.